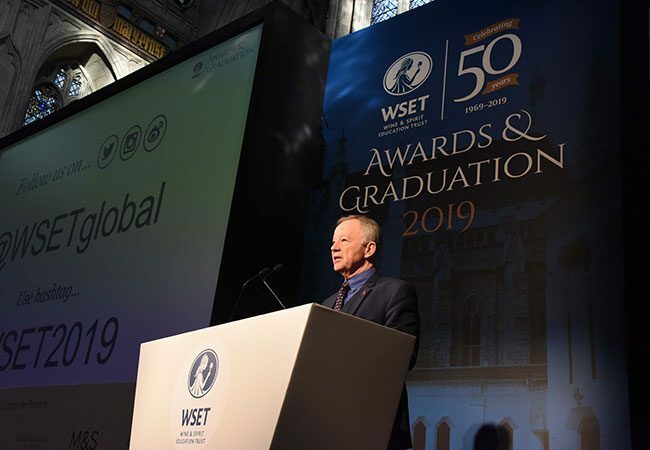 As it celebrates its 50th anniversary year, the Wine & Spirit Education Trust (WSET) has awarded its highest number of diplomas. In the 2017/18 academic year, 532 WSET Diploma graduates were named, a 21% increase on the previous year. Candidates came from more than 40 countries, including Chile, South Korea and Croatia. More 500 wine and spirits professionals from around the world gathered at the City of London’s Guildhall last night (22 January) to celebrate students’ achievements during the WSET Awards & Graduation Ceremony. Hosted by WSET honorary president Steven Spurrier and chief executive Ian Harris, the event also saw outstanding candidates presented with awards and scholarships in recognition of their achievements. Joseph Hallam, a certified educator and international development advisor at WSET, won the Vintners’ Cup for achieving the highest overall mark. West London Wine School received the Riedel Trophy for the WSET Educator of the Year award, while freelance writer Caro Maurer MW received the Outstanding Alumni Award. This year the WSET Lifetime Achievement Award went to Mary Ewing-Mulligan MW, the first woman in North America to become a master of wine, in recognition of her contribution to the development and growth of the WSET in the US. Harris commented: “Today, we not only congratulate our largest ever class of diploma graduates and our scholarship and award winners, but also mark the start of our 50th year providing education and qualifications in wine and spirits. “With over 750 approved programme providers and three offices across the world, WSET’s global presence is stronger than ever. This year, the WSET will launch a Level 3 Award in Spirits, catering to demand for a more advanced spirits qualification.